Franca. Catherine. Shirley. Michelle H. Carol. Kate. Mary Margaret. Sheila. Brigitte. Nine women. All part of my local metastatic support group. All of them are gone within the past 16 months. Ranging in age from 44 - 74, with the average age being 55. The national average age of death due to metastatic breast cancer is 61. Their lives aren't measured by how long we had them here on earth, but on the value they each had to family and friends. I miss them all. It's not about awareness and it's not even about research. It's about people. Beloved people. My heart is saddened by any death due to this disease, but it seems to hurt more when the death is of someone who was born after I graduated from high school. Thuong was a part of an online support group I'm a part of and roughly two weeks ago, she let us know that her options were exhausted and that it was time to stop all treatments. She died on March 17 at age 32. She leaves a legacy of being the founder of the Breast Cancer Network Vietnam. Breast disease is not often talked about in Asian cultures and she worked tirelessly to aid women who felt they had no other voice. http://bcnv.org.vn/…/News-and…/Please-live-like-warrior.html The website says about her, "Though she was [sic] resting in peace, all her works will be continued and followed by millions of members, volunteers, the youth in Viet Nam and all over the world. This journey will not stop. And we will still be living like warriors." March is marching upon us and I continue to be grateful for each day I've been given. None of these days are to be taken for granted. My tumor markers continue to rise and we know it's only a matter of time before whatever cancer is generating the rise in the markers can be seen on scans. We increased the dosage of my chemo for the past cycle, yet the dosage proved to be too toxic for me to tolerate. Once again, my hands reacted rather strongly and my feet developed painful hot spots. More than that, though, was crushing fatigue. This wasn't a "I need to take a nap" type of fatigue, but a "I don't want to get out of bed for three days" kind of fatigue. I am taking an extra week off the chemo cycle as I continue to regain my strength. We had a brief scare this week as I started to see halos around lights. While everything pointed to this being cataracts, the sudden onset was startling. I was seen within two hours of calling in and spent two hours being looked at and evaluated. My heart skipped a beat when the optometrist said (after looking into my dilated eyes), "Well, let me type my notes into your chart and then we'll talk." I immediately thought, "She sees a tumor." As Arnold Schwarzenegger's character in "Kindergarten Cop" said, "It's not a too-mah!" Short and simple, it IS cataracts, something I would have probably developed over time, but have much sooner in life due to the extended cancer treatments. I saw the oncologist team the next day and they said that it's not uncommon for it to be sudden onset for their patients. Additionally, they told me I could have surgical correction at any time as such a surgery wouldn't interfere with any of my treatments. For now, it's a minor irritation, but should it impede my vision in a meaningful way or impact my driving, I'll schedule the surgery. I still struggle with finding my voice ... with being real with myself and with how I portray myself to others. Do I really believe everything I say? I certainly hope so, but at times, I fear I am speaking what people expect me to say ... projecting an image that people want me to have. While my faith is a constant part of my life, I never know how much of it to share on my advocacy page. While breast cancer research is something I feel strongly about, I never know how much to talk about it here in Caringbridge. How do I combine my worlds? To be frank, I don't know how to do this. I don't know how to live with cancer. I don't know how to die of cancer. I struggle with knowing how to prioritize the activities in my days. I so desperately want to love others as I've been loved, yet get caught up in judging the very people I love. If I don't eat right or if I don't sleep well, I am "useless" to my family. If I'm exhausted beyond measure, I find myself asking my 13-year-old son, sick with a cold, to prepare his own dinner of boxed mac-n-cheese ... and I feel like a failure because I am too tired to do anything more for him. The ups and downs of living with cancer are so unpredictable. I know that each of them pass, that all of this is temporary, but the down times (when in the midst of them) seem to last forever (even though I know they don't and that they are far fewer than the up times). I don't know when or how to disengage from something I may be passionate about, yet need to leave for someone else to take on. (My thanks to the writings of Oliver Sacks, who, while discussing his own terminal cancer diagnosis, used the term "disengagement" to describe letting go of items that no longer needed to be a top priority in his life. He worded exactly how I felt, thus, I am borrowing the term and using it as well.) Letting go of something you care about can be hard to do when the letting go is based on time rather than on impact. Living in the unknown is hard. On Monday, March 2, social media was stormed by those who want more awareness and more research for metastatic breast cancer ... the only kind of breast cancer that kills. I entered the foray enthusiastically. I made 24 slides and scheduled them to be posted every hour, on the hour. I posted other information to go along with those slides. I read what others posted. I shared what others posted. On Tuesday, March 3 (Triple Negative Breast Cancer Day), I tallied news reports that picked up the social media activity. And then, I sunk into a brief time of depression and despair. A woman in an online support group died. A well-known social media activist, Lisa Bonchek Adams, died. Kara Tippets, another well-known blogger, isn't doing well. A dear friend in my local metastatic support group isn't doing well. In other words, all that activity of last Monday is, quite simply, too late for these women. It's too late for me. While seeing such interest and energy generated on behalf of metastatic breast cancer was both exciting and invigorating, I keep myself grounded in reality. There is no cure for this disease and there is not likely to be one in my lifetime. 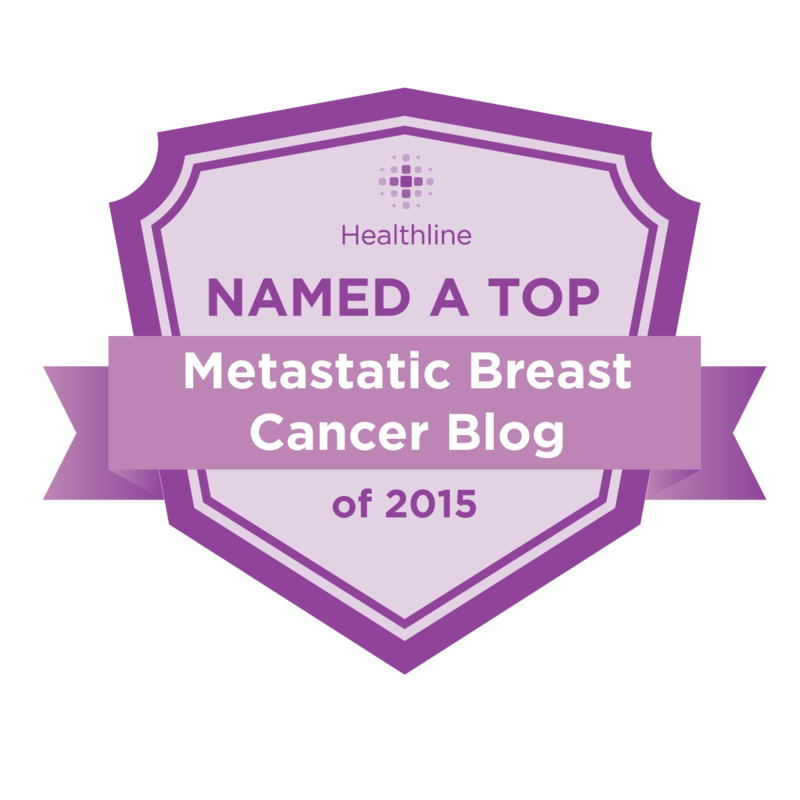 I have been living with metastatic disease for over three years. I'm one of the fortunate ones who tends to respond well to treatment for a while and then the treatment stops working and I move on to the next one. I have had three primary chemotherapy drugs (the infamous ACT (taxotere, not taxol) combo; one lumpectomy; 29 breast radiation treatments; Tamoxifen; 20 neck radiation treatments due to a broken vertebrae and extensive disease in the neck; one bilateral salpingo-oophorectomy (removal of both ovaries and fallopian tubes); Femara/Letrozole; a clinical trial combining a trial drug with Fulvestrant/Faslodex which brought about medically induced diabetes; and now I'm on Xeloda. My primary treatments were for what was originally diagnosed as Stage IIIb disease, but that was revised to Stage IV when the "recurrence" exploded into 23 out of 25 vertebra and into both sides of my hips and into a rib. While on Tamoxifen, it spread to the remaining two vertebra and into a hip socket, as well as into my sternum and a couple of more ribs. I was only on Letrozole as a place holder until I was put into the clinical trial. While on the clinical trial, the disease spread into my liver. My bones are healing well and are considered to be stable. My liver is "calm," to use the words to describe my last scans. The 10 - 15 lesions that were visible back in July are now down to just 3 - 4, although, those 3 - 4 are much clearer now. Fortunately, they remain very small and my liver function is not impacted at all. Having years of tumor marker records have proven that those numbers are reliable for me. When they continue in an upward trend, we know that the disease is either increasing in activity or that it's spreading somewhere and we sit them out, waiting for the new activity to show up on a scan. This is so we can use the best treatment plan for that particular spread. I've been on Xeloda since May 19, 2014 and my body has responded beautifully. My tumor markers rapidly dropped into the normal range. However, the last four measurements show a very clear upward trend. The Xeloda is no longer as effective and at some point in the future, we will have to change plans. I am not afraid of death. Dying really doesn't bother me (much). This doesn't mean I want to die, but it means I'm at peace with the idea. I have a strong faith system and I long for the perfect world that I believe is to come. However, I don't long for my husband, children, extended family and friends to experience losing me. I'm a natural "rescuer." I have to be very well aware of this ... that I am not everyone's savior and that it's not my job to rescue everyone from everything. This has been a lifelong journey for me ... to balance out what I can and cannot do and to balance what I should and should not do. I cannot rescue my family from pain. I cannot protect them from loss. I remember my daughter losing her beloved baby doll when she was four years old and the heartbreak in me at her searing grief was overwhelming. I did everything I could to find that baby doll to no avail. Fortunately, she had another doll that she loved almost as much and that doll was able to help her move past her grief. A year later, when we had moved abroad to Beijing, China, she left that doll in a very large store. The horror in her eyes at discovering that she didn't have "Baby," is something that I'll never forget. We immediately rushed back to the subway and returned to the store. An hour had already passed by. The doll was nowhere to be found. We went to the customer service desk and asked about the little red back pack she carried this doll in, not expecting it to be there. To our great joy, it was. I carefully opened the backpack and "Baby" was still there. My daughter and I literally sat down in the middle of swarms of people in this store and wrapped our arms around each other with "Baby" in the middle and we both cried tears of relief. Our mourning had turned into joy. When I die, I won't be there to wrap my arms around my daughter to help her through the grief process. I won't be there to wrap my arms around my son to comfort him and to reassure him that life will return to a different normal. I won't be there to wrap my arms around my husband to help him process a life without me. I won't be physically present in their lives anymore. While I"m at peace with my upcoming death (may it be a long time away), I ache at the thought of what my family will go through. I grieve at being a "story" in their lives, even though I know that I'm so much more than a story to them. Metastatic breast cancer kills. A social media awareness campaign brings this once again, well into my forethought. While this needs to be in the foreground, it shakes the ground that I walk upon. It can be hard at times. I don't need a party. I don't need a once-in-a-lifetime trip. I don't need to fulfill a bucket list. I need my faith (disease or no disease), but outside of that, I need a cure. Awareness isn't enough. One day isn't enough. We need to keep storming the change makers to go ahead and make that change! We need the money that is being raised in the name of research to actually go to research. Breast cancer is more than one disease. There are 16 different types that are known, with another ten or so that are so rare that no standard of care exists for them. 75% of breast cancers are fueled (not caused, but fueled) by estrogen and progesterone hormone receptors. 20% of breast cancers are fueled by a protein receptor known as HER2. One can be both hormone and HER2 positive or test positive for only one. Targeted therapies exist for these receptor positive cancers. However, 15 - 20% of breast cancers have no known fuel source. They test negative for both hormone receptors and they test negative for the protein receptor. These cancers are then dubbed "triple negative." While triple negative breast cancer (TNBC) can often respond quite well to chemotherapy, there is no follow-up treatment to help prevent recurrences. TNBC is often quite aggressive and much more research is needed to figure out what makes those particular cancers grow. My friend, Wanda, died of triple negative metastatic breast cancer on November 16, 2014. I still miss her. I still have all her texts on my phone. She should still be here. Today is Triple Negative Breast Cancer Day. We need more. So much more.